Excellent call and analysis on the Orange Bowl guys! First time buying your service and my wallet thanks you!! Will do business again. We all know about the rich tradition of college football. The history, the rivalries and the pageantry are as rich and as diverse as the country itself. With that, the face of college football is changing. Over the last couple of years, conferences are re-aligning; rich, storied rivalries have been dissolved and a seismic shift in college football is underway. With the recent announcement that college football is moving towards a playoffs system, it is clear that the old way of handicapping college football games is gone. Sure, you still have to know Xs and Os and understand and factor-in things like personnel, injuries, and momentum. But now you have to factor in new matchups and how these different alignments will affect how you make your college football picks. Now more than ever, it is imperative that you get your free college football picks from a sports handicapper who has had a proven record through all the different changes to this sport. As things change, I will work my hardest to continue to be your No. 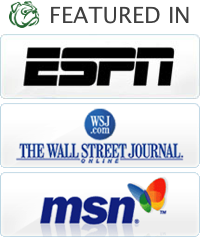 1 source for sports handicapping information and advice. Speaking of track record, I have weathered changes to the college football landscape before. Several years ago, college football went through another huge change with the advent of the Bowl Championship Series (BCS). All of a sudden, winning was no longer enough for a school to be considered tops in the nation. More and more variables were introduced to determine a "true" National Champion. More emphasis was placed on factors like a team's strength of schedule made betting on college football even harder. Along with the advent of the BCS, coaches' challenges, and updated overtime rules forced me to adapt. I have successfully updated my unique system for making college football bets. All of my research, raw data and profitable situations are always up-to-date, cutting edge and are simply the best around. And just because it may be the offseason, I'm not resting on my laurels. In order to back-up my proven successful track record, I never stop working. So when spring games evolve to the regular season, conference schedule and bowl games, rest assured that I will have my finger on the pulse of the new college football landscape. If you are ready to take your college football plays to the next level, make the right call and join me. Sign up for college football picks against the spread and start winning now! It used to be that a winning record was enough. Now you have to have a tough schedule, run the score up on your opponents, and win all of your games. My college picks take these new rules into account. While this might make for an undisputed champion (although you'll be hard presses to find anyone who would agree to that), it has done some tricky things to college football betting. You now need to have the insight & knowledge in order to beat the bookmaker week in and week out when it comes to the BCS. The BCS equation makes it so that taking the points can be a dangerous proposition, unless you get your free college football predictions from a trusted source. Teams now have an incentive to run up the score and keep their best players in for the entire game. This does make it difficult to take the points, while also doing some other interesting things to the rest of the season. No score is ever safe, but what the BCS does for the college football betting world is give us a little security from point shaving; however, it also forces people who are looking for college football predictions against the spread to really consider their source when choosing the underdog. And as long as you are using my college football picks, you are on solid ground. Picking underdogs is just my game. There are three seasons that make up college football: non-conference play, conference play and Bowl season, and I have a methodology for betting all three seasons. The process to hiring a professional handicapping service and what to expect from a football handicapping service vs. the do it yourself approach. Access all of my previous college football season records here. Win or lose, I give you visibility to all past pick statistics including my in depth newsletter write-ups. Real time lines and odds for all upcoming college football games: check out full game ATS, Totals and Moneylines. If you want to know which way the public is betting, this is your page: a collective source for public consensus information on all upcoming college football games. Click here to purchase a premium college football picks package, you'll have access to weekly picks, detailed write-ups, game information and top of the line customer service. When I first came across the Wunderdog, I couldn't believe the underdogs he was picking. Well, now I am a believer. Great picks and advice all season long. Keep up the great work.